Liberal Democrat councillors will vote against proposals to extend the tram to Newhaven - believing the inquiry into the problem-hit first phase should be completed first. 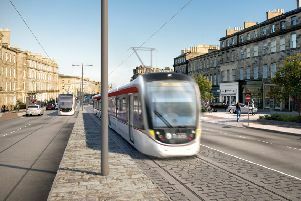 The city council’s transport and environment committee will meet on Thursday to consider the tram business case - ahead of full council determining whether to press ahead with the extension on March 14. The Liberal Democrats have following Conservative councillors in pledging to oppose the plans for five critical reasons. The party, which as six councillors on the authority, is refusing to back the plans due to the fact that Lord Hardie is yet to report back his findings into the first phase of the tram project. Lib Dems are also claiming the SNP-Labour administration has failed to show how the proposed extension will be linked to public transport improvements across the Capital. Fears have also been raised over the impact of Brexit on the viability of the business case, as well as the impact of a £20m dividend from Lothian Buses on the operation of the company. The Lib Dems are also concerned about the impact the project could have on the council’s reserves, amid a period of economic uncertainty. Liberal Democrat group leader, Cllr Robert Aldridge, said: “This has been an extremely difficult decision for us to take. However, after scrutinising the final business case and reflecting on all the different issues, we do not believe this is the right time to extend the tram. He added: “There are other serious issues too. The SNP led administration has failed to show how a tram extension will link to wider public transport improvements across the city. We don’t know what impact the £20m special dividend from Lothian buses needed to fund the tram will have on bus routes, fares and other operations. “We also cannot ignore the wider uncertainty and the threats to our economy because of the Tories’ disastrous handling of Brexit. This could drive a coach and horses through many of the assumptions on which the tram business case is built. It could expose the Council to massive financial risk at a time when the public finances are already under huge pressure.